Dental health is a fundamental component of physical health. In the past many thought that dental care for indigenous people could only be offered by a a dentist from the west, coming to provide service. These dentists frantically tried to treat all maladies, but returned heartbroken at the needs that they were forced to leave behind. A new paradigm was needed. mPower Approach created a system to train indigenous Christians to provide these basic needs utilizing new and low cost technologies. 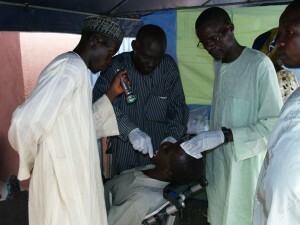 When the dental extraction module is completed, a team of Community Dental Health Workers (CDHW) are equipped to serve the dental needs of their community while, more importantly, sharing the gospel. The dental extraction module is a comprehensive training and technology package equipped with a trainer dentist who instructs the indigenous trainees to perform basic dental extractions. This is accomplished through classroom and hands on training for five days. Instruction also includes information on integrating a Christian worker into the culture, serving the people, and generating the means to materially support the workers family. Please call 502-544-9031 and a ministry representative can help you start the empowering process!